Last Sunday after church, hubs, LO and I were heading to one of our favorite lunch destinations: Panera Bread. Yum! We're taking our normal route on the freeway (I call it a freeway since I'm from California; most people around here call it the interstate or highway), when we notice a serious traffic jam straight ahead. "What in the world?" I wonder. It's quite unusual to have traffic of any kind on a Sunday afternoon. We decided to get off a couple of exits early in order to miss the parking lot and arrive at our destination quicker. We arrive at Panera and both enjoy our most favorite item: Broccoli Cheddar Bread Bowls. De-lish! Now, I realize the pic is awful 'cause I took it on my cheap-o cellphone. But can you see what I saw? 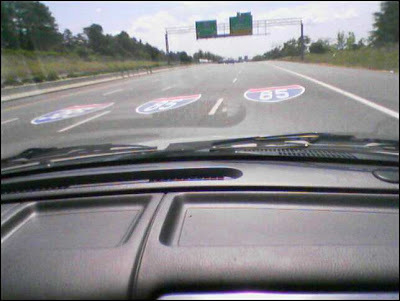 They painted little pictures of the freeway signs on the road itself! Can you believe that? Have you ever seen that before?? I was just shocked. I mean, I understand you have those "visual" people out there that need to physically see something to process it effectively. But isn't that what those big green signs are for that are prominently displayed over the freeway on those metal poles (you can even see them in the distance in the pic!)? I couldn't help but think, "Yep! That there's my tax dollars hard at work!" You and me? Share the same tastes at Panera. Oh bread bowls...so yummy! Is this just in the South? Honestly. I'm curious. I don't recall seeing anything like this while driving in Chicago, Boston, Philadelphia, LA, Tucson, Detroit, Indianapolis, etc. But hey, it's possible. Maybe this is being implemented everywhere and we just don't know it. I know they've done this in Asheville, NC. But wait, that's still in the South, isn't it?